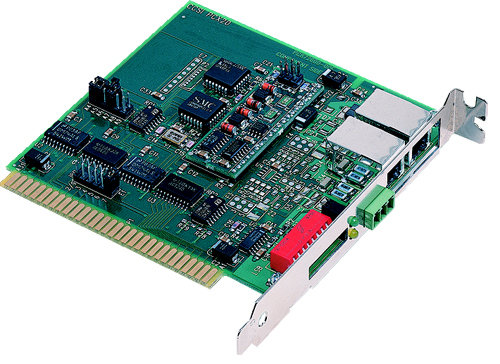 The PCX20 Series of Network Interface Modules (NIMs) offers dependable ARCNET connectivity for XT/AT compatible computers. This product is designed with the COM20020 ARCNET controller chip. Features include command chaining, sequential access to internal RAM, duplicate node ID detection, and variable data rates up to 5 Mbps. There is no requirement for wait-state arbitration. Each PCX20 module has two LEDs on the board for monitoring network operation and bus access to the module. It also has an external DIP switch so that node addresses can be easily reassigned without removing the module or opening the computer case. There are eight models within the PCX20 Series. The PCX20-CXS supports coaxial star configurations requiring external hubs if other than point-to-point communication is needed. The PCX20-CXB accommodates a multidrop or coaxial bus configuration, typically without any hubs. Other versions include the PCX20-FOG-ST for fiber optic cable with ST connectors. The PCX20-TPB supports multidrop twisted-pair cabling using RJ-11 and screw terminal connectors. One unit provides DC-coupled EIA-485 operation: the PCX20-485D forces backplane mode via hardware for those users having legacy software that is incapable of invoking backplane control. The PCX20-485X offers transformer-coupled EIA-485 operation with the backplane mode forced through the hardware.